Brilliant inspirational first blog post by Tracey in York. Ver helpful for small business’ 🙂 thank you Tracey!!!! 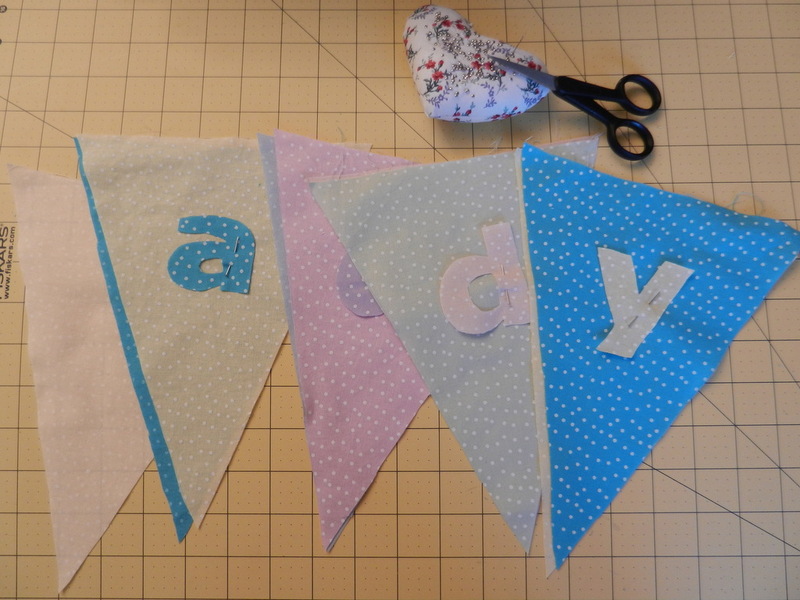 fab tutorial on personalised bunting! I thought I would give making bunting a go, it is quite a nice way to add colour to a wall and great way to personalise a bedroom. I drew a triangle with the measurements of 18.5 cm (7.5 inches) along the bottom, 26 cm (10.5 inches) along each side, and 24 cm (9.5 inches) inside from the top of the triangle to the base. I used cardboard for the template, see below. I then cut out 10 triangles of coordinating fabric because I decided to make 5 double-sided flags. I decided to personalise my bunting with my daughter’s name, and no, her name is not ‘addy’ as per the photo below, I had already started sewing the ‘M’ on the flag before I remembered to take a photo! For the lettering, I printed it off and then simply drew the letter onto fabric and then cut out. Please come to the etsy made local craft fair in December in York. Lots of very talented crafters so you can stock up on goodies for chrimbo and support local businesses at the same time. Over two days 2-3rd of December !!!! Following our successful first Repair Café in April, Planet South Bank is putting on another event on Saturday 21 October (10.00am-1.00pm) at Clements Hall in York. The date falls in International Repair Café Week 2017 (14-22 October) when communities around the world will be organising similar events. There are now over 1,300 Repair Cafes operating globally, with 92 in the UK. Monitoring by the Repair Café International Foundation shows that, in the past year, approximately 250,000 kilos of waste were saved collectively and that the most popular items for fixing were bicycles, vacuum cleaners and kettles. Our experience from our April event confirms the popularity of small electrical items; chairs, lamps, clocks, jewellery and textiles were other popular items brought in for repair. Overall, we managed to repair 60 items, with only five items found to be not fixable at all. Thought I would go on a little break to a place I’ve always wanted to explore.. Amsterdam! So I’ve just come back from there after five days. It’s been really good fun, I’ve met a lot of lovely people and stayed in a hostel! I didn’t want to spend too much money on accommodation so I looked on booking.com and found a central hostel called ‘clinkNoord’. I shared with three other people and we had our own private bathroom which was Nice! The hostel was over the river right next to train station, so every 10 minutes a ferry came and carted people (mainly on bikes) across the water for free which was different! Oh my god.. I have never seen so many bikes. I thought York had alot but I actually found out in Amsterdam there are more bikes then people! And there are plenty of electrical cars that are tiny which is blizzare! The hostel was lovely I really couldn’t fault it. I had to change my room because the first night I couldn’t get to sleep at all because the two guys (who I ended up spending most of my time with) were snoring, so the staff kindly let me swap rooms at 4am in the morning and it was so much quieter. Every where is spotless, staff were wonderful and it was very close to the train station which I always find helpful. And it was very cheap! So yeah… I met a few people, colin from Vancouver and Kim from norway. So I got to hang round with them on all of the days which was fantastic because I’ve never done that before. I love staying in airbnbs because I’m a private person and have routines, but it was isolated. Hostels you get to meet so many different people from all over the world! Here are some photos I took. The weather wasn’t great.. abit like England if I’m honest!